“An excellent dive regarded by many divers as the best dive site in the Maldives. It is a photographers’ paradise and a mecca for marine biologists. This is a dive with many possibilities. The best diving is on the outside corner of Dhiggaru Falhu. Divers can start at a bend in the outside reef where there is a cave at about 30 meters with holes you can swim through. Around the bend near the entrance to the channel is a special place with many caves and overhangs. 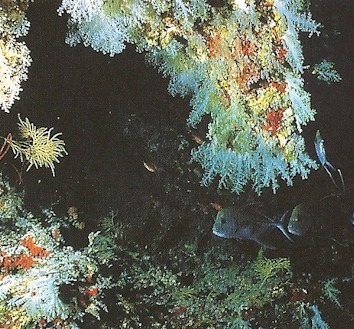 These caves have a thick covering of wavering soft coral in all colours. They look like blooming cherry blossoms in springtime. Most of the cherry caves are found between 25 and 40 metres.